This module provides support for MongoDB data store. 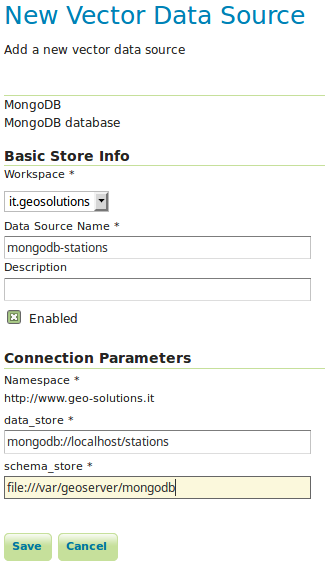 This extension is build on top of GeoTools MongoDB plugin. Navigate to the GeoServer download page. Find the page that matches the version of the running GeoServer. Download the MongoDB extension. The download link will be in the Extensions section under Vector Formats. Extract the files in this archive to the WEB-INF/lib directory of your GeoServer installation. The URL of a MongoDB database. The absolute path to a data directory where GeoServer will store the schema produced for the published collections. Configuring a MongoDB data store. 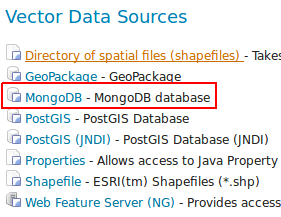 For more details about the usage of this data store please check the GeoTools MongoDB plugin documentation.